A dispute between two 17-year-old female students outside the Institute of Technical Education (ITE) College West campus on Thursday (Feb 21) resulted in one of them being arrested and the other being taken to hospital. In response to queries by Stomp, the police said they were alerted to a case of voluntarily causing hurt by a dangerous weapon at 1 Choa Chu Kang Grove at 1.57pm. The victim was conscious when taken to Ng Teng Fong General Hospital. Stomp understands that her injuries were not life-threatening. The other girl was arrested in relation to the case and will be suspended from school. 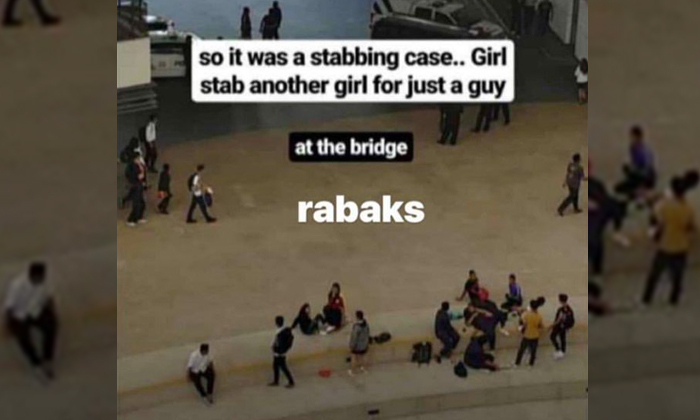 According to screenshots posted by Twitter user @uhuhsiolz, the incident was said to be over a guy "that’s not even in ITE," though Stomp is unable to confirm that. In one screenshot which shows a conversation describing the incident, the two girls were said to have poured liquids on each other before engaging in a physical fight. The other screenshot appears to be an Instagram Story showing a photo of the scene. Following a Stomp query, Dr Goh Mong Song, Principal of ITE College West, confirmed that an "assault incident" involving two students took place outside the school. Dr Goh said in a statement on Friday (Feb 22): "The injured student was sent to hospital and discharged on the same day. The college is rendering whatever assistance required and has met the student’s family. "We take a serious view of the matter and do not condone such behaviour. The assailant will be suspended from school." 0 Response to "Girl, 17, arrested after assault incident involving dangerous weapon outside ITE College West"